Late Brahms Piano Works -- that's Ops 116 - 119 mainly. Topic: Late Brahms Piano Works -- that's Ops 116 - 119 mainly. Re: Late Brahms Piano Works -- that's Ops 116 - 119 mainly. I am a big fan of Ranki in these works. But not taken collectively (as "complete sets"), I like Richter the most. I'm quite curious to read that essay. Where is it? 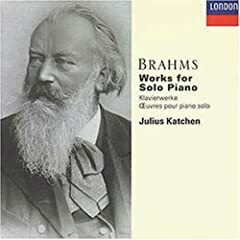 George, Isn't this set by Katchen considered the gold standard for Brahms solo piano works? I had this on LP and have never replaced it on CD. I have Lupu in the late works, excellent, but without quite that magic touch I encountered with Katchen. Perhaps I will look out for it again. How does the sound stand up? Yikes, which Thread was it??? Anyhow, thanks to the Threads for the conversion! Indeed they are. Check PM. I have several recordings of Brahms late piano works, but my favorite remains the Gould collection of 10 Intermezzi (reissued with the op.10 ballades in a two CD set). His playing is wonderful,and in some cases very unusual (what's new), especially on op.118, n.6. I have never heard another pianist play the central section legato (probably because it wasn't written that way...) but the effect is mezmarizing. Gould's Brahms intermezzi &c is the only Gould recording I have. It's really special. However Lupu and mono Rubinstein are my preferred recordings. There are some other Op 118/6s which I think are special. The one I am most impressed by at the moment is from Richter in 1954. in the Hungary box. More than anyone else I know, he seems to move from despair to something wild and unchained, and on to something else I can't find the word for -- stillness maybe. But I don't want to minimise Gould's achievement with it. Even less so Yudina's. Recent Brahms solo piano pleasures -- Schnabel's Intermezzi; Cziffra's Paganini Variations; Grimaud's first Brahms CD on Erato; Tiegerman's Op 118/5; Richter Op 118/6 from Hungary in 1952; Moravec's LP of Intermezzi (Nonsuch); Beveridge Webster's Schumann Variations. the Sokolov Heidleberg concert. Thinking about -- Rodriguez's Paganini Variations and Waltzes; Cziffra's Hungarian Dances (live at Senlis); Arrau's 2nd sonata; Edwin Fischer's variations on an Original Theme; Kocsis 3rd sonata; Lubimov's Handel Variatins. Undecided about whether to buy Schliesmann's Brahms CDs, though it's inevitable that my curiosity will get the better of me in the end. I can't make up my mind about this pianist. I wish Mindru Katz had recorded more of these, his B flat minor Op. 117 is right up my alley. I have not heard the Moravec snippets yet, but I am guessing they cannot be much less than great. I wonder why all of his solo stuff never made it to CD. A lost opportunity IMO. Orange you glad we have a sense of humor at GMG? I can't hear you, I got a banana in my ear. Late Brahms and Moravec sounds like a marriage made in heaven. Anyone preventing us from hearing this should fry in boiling oil.